← Byron Bay Gifts: Need a unique gift for someone? It’s not so much that I’m lacking the creativity, it’s just that I always think about who is going to see it. I feel weird blabbing it on-line without looking directly into the face of the person I’m telling. I know, I blab everything else on-line, but this is different. I told most of the my friends I interact with in my day-to-day life, really early. I wanted them to know why I was flaking on meeting up with them, had barely enough energy to walk down the street and why I was repulsed by eating any food after 1 o’clock in the afternoon. But, we could talk about it. I could see their face. I knew their story. On-line is so different. I think about everyone who sees ‘the announcement‘. How does it make them all feel? It’s a touchy subject. For most people, it’s fine, it’s great! But, there could be people out there, whose day I’m unintentionally going to ruin. I almost feel silly for writing an entire blog post on making a pregnancy announcement on Facebook. But, I know that women actually stop looking at Facebook if they’re having a tough time in baby land. I also know that real emotions can affect you for a whole day or days, just from innocently scrolling through a newsfeed and seeing something you don’t want to see. It’s easy to say, “Just scroll on” but once you’ve seen it, that’s it. I do know people who skip the pregnancy announcement all together and go straight for the birth announcement. I almost did that this time. While I do really love the secrecy of doing it that way, it’s hard for me to keep my mouth shut for THAT long! With my first, it was 6 months before I said it on Facebook. With the second, 5 1/2. This time, I’m half way through, but I want to start writing articles on pregnancy and it would be a little bit of a giveaway if I didn’t say it first. And then, I have to say, it’s just awkward. Procreation is a really personal thing… you know??? Another thing that’s weird about the ‘announcement‘, whether on-line or not, is the touchy taboo we’ve created around openly speaking of pregnancy before 12 weeks. That really needs to go. It’s one thing if you WANT to keep it a secret. But, whether the pregnancy is a secret or not, it’s still something that has happened and it should be totally cool to tell people early. I told a few people, in person, around 7 weeks and they told me to get back to them when I was 12 weeks, just to make sure it was, like… you know ‘real‘…. Anyway, it’s something I’ve thought a lot about. 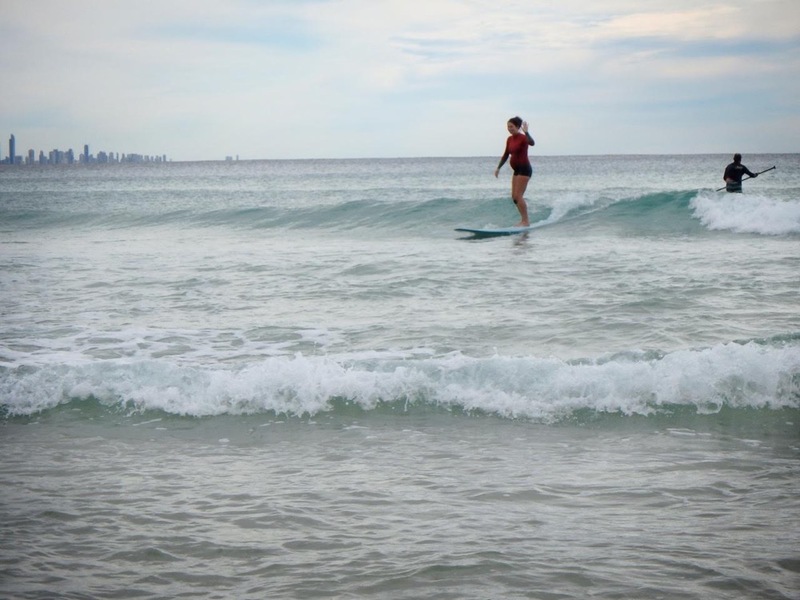 In case you’re wondering how I go surfing while I’m pregnant… it has something to do with me sticking my bum way up in the air while I’m paddling, so as not to squash the baby. Once I’m up and riding, it’s fine. I’ll keep going until about 6 months. Then I quit, beach myself on the sand and watch my husband catches all the waves. Posted in Pregnancy and tagged pregnancy announcements. Bookmark the permalink. Congratulations! Your bump is so cute! Congratulations! Wonderful to see you and your little one riding the waves together. What fun to share! I’m with you on the ‘ being out there’ before the 12 weeks thing. I shared a pregnancy at 9 weeks with close friends and our 5 year old son. The following week I began to bleed then needed a ‘D&C’ operation as the baby had stopped growing. It was an awful experience but one I needed support with from those who shared the joy as well as the sorrow. The baby had been very much a reality. Our son was able to grieve through his loss too. Good to share. Enjoy your baby every second along the way. Congratulations! Looking forward to your posts on having more than two. All these choices feel such a minefield of politics and sensitivities these days that I’m sure you won’t be shying away from discussing. Wishing you a healthy happy pregnancy. Kate you are an amazing Mom! Glad you are having child! Many Blessings to you! Wonderful news. You share the news well on Facebook. Congrats Kate! Me too I have 2 girls, almost 3 And 4 months. I would love to have a third one, but we can not afford it financially and we don’t have a “village” around us who can give us a hand. But still I dream of it.